Life, love, learning... while trying to keep up with three short people! It's been an up and down kinda week his week. The first part of the week was UP ... Monday we had our group classes for Art, French & Science. The art classes have been cycling through art from other cultures... some age groups did Mexican suns out of clay, one week Frodo's group did African style masks done by using pastels on black paper, and then scratching patterns into the pastels using a special stick, and this week it was China week. Frodo did a most EXCELLENT Chinese dragon, which is definitely going to get framed! 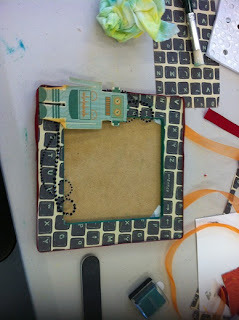 And then Tuesday, we had a craft workshop at Kaiser Craft...holy moly, I did NOT need to know this place existed LOL! It's a woodcraft shop with all those excellent particle board crafty bits, neat papers etc. I'm SO going back there! The kids were making the simplest project to start with, a picture frame. They had girly ones with pink polka dots, and boyish ones with robots and computer printed paper. If you ever see those gorgeous craftwood things that have scrapbooking paper applied to one face and it's PERFECT and neat? Here's how they did it... glue it on... trim it to about half an inch from the edge... and use a heavy duty emery board pulling it in a strong downward motion on the edge of the wood. It 'cuts' straight through the paper :) Very cool & very clever! Here's Frodo with his paper on, and ribbon edging (hides where you put the back of the frame onto the front peice) in place.. and his blingy bits on (he was SO chomping to get those on lol) The little robot dude is on 3d sticky pads to add a little more dimension to it. Ok, blogger and I are gonna go 'round! This picture, in MY files.. is upright... for some stupid reason blogger refuses to show it that way and no matter how I save it rotated, it magically appears tipped over like THAT *sigh*. But there you have it, the finished product! We've decided we'd like to make these regular, either monthly or bi-monthly, events... next time we are doing a larger robot that coordinates with the little paper robot on Frodo's frame. The down side of the week is that Frodo & I had a bit of a blow up... he was not wanting to do anything (except of course on the computer, then he'd try to do as little actual schoolwork on there as possible and then try to go play games). This resulted in a very crappy couple of days, but we have done some reevaluating of our methods & I think we're going to go with the very laid back distance ed school we were with a few years ago, again next year. Their reporting requirements are much different, and 'fit' us better. We'll see how that goes. But... we're ending the week on a positive come hell or high water! We have math fun, history pockets and Greek Myths on tap for tomorrow! We've had a pretty crazy week or so here at the Hobbit household. Frodo had a particularly awesome science workshop at Bim Bam Boom, which is a terrific toy & craft store. They have THE best selection of high quality toys & educational fun stuff.. not to mention crafty stuff of every description :D The lady that runs the workshops is SO wonderful with the kids, and it's especially noticeable with Frodo. His occasional odd behaviour & silliness doesn't even phase her, and she works so well with him to help him stay engaged & on task. First up was building & painting a clay volcano, which was good fun. Then they did the old bicarb and vinegar eruption trick (three or four times, with different coloured 'lava' hehehe) Of course, when we arrived home in the afternoon... Merry & Sam just had to be shown how that worked... so we had a very geologically active kitchen counter LOL. You can see two of the other projects the kids made in front of Frodo ... a plane (that actually flew) made of a drinking straw and 3 strips of paper, and a paper cup 'chicken' lol. The kids drew a chicken on the cup, then tied a 'matchstick' to a string and stuck it through the bottom of the cup... hold one damp sponge around the string tightly and pull ... I kid you not it sounded like there as a whole flock of chickens in that room hehehe. The last project really went over surprisingly well with Frodo, as he gets quite annoyed by having 'stuff' on his hands. The kids made cornflour/cornstarch 'goop'. They just missed plain old cornflour & a bit of water until it was basically glue... then played with it. If you keep it moving, it goes SOLID and will literally crumble... but the minute you let it sit still, it reverts to it's previous goopy state! (ok, *I* was as impressed with this as he was... did NOT know it did that! lol) The look on his face was pretty awesome... this is not the type of thing that usually gets a smile out of him! Nice to see Mr. Sensory step outside his comfort zone! Frodo loves Minecraft and really enjoys playing in creative mode. He's got a 'thing' for Sonic the Hedgehog games at the moment, so he had to find a picture of Sonic, then he split his screen and recreated it in Minecraft. He did a pretty darn good job of it, if I do say so myself.. and was very pleased with himself. The kid loves drawing, and loves creating digital 'drawings' as well! The latter part of this week has been pretty slack... we have had Merry & Sam home since Wednesday with a pretty nasty cough, fever, and just general BLAHness. Sam has actually been quite the over achiever and developed croup *sigh* so we've visited the doctor and have had oral steroids prescribed. He's still coughing & chesty, but considering how he was so bad that he coughed himself into an epic nosebleed? I think he's MUCH better. going on this week. As you can see, Smudge the kitty has been snuggling the sickness away :) This was the boys watching Better Homes & Gardens... Frodo LOVES the cooking segments. Sam is still looking a bit meh, and I think it shows. Both he & Merry are still sporting fevers as well... so I think it will be a quiet weekend at home for us. Stress! & When is the garage not a garage? We are obviously trying to keep this from stressing the kids, while not lying to them about WHY dad is home. And amazingly enough, we are both remaining optimistic! I'm a firm believer that when life closes a door in your face... there is another one open somewhere up the hall... we've just got to find it! Last week, having DH home (in addition to the usual distraction of my teenager) we discovered how HARD it is to get schoolwork done. Our home has one big main living area with the kitchen, dining area and lounge all combined. This is where we *usually* do our schoolwork... but that was pretty hard to get ANYTHING done with DH on the phone 'discussing' the situation with is boss (yeah, discussing is code for cussing him out lol) and on the computer job hunting. So we had a few days off with regards to formal schoolwork.. we watched a lot of the Olympics, read a couple of books about the games (one about the Ancient games, one about the Modern ones) and Frodo started reading The Adventures of Odysseus & The Tales of Troy (a childrens' adaptation of Homers Epics). He did a ton of cooking with me (we made banana bread, and zucchini fritters... which he did on his own.. and he helped dad make apple crumble for dessert, YUM!) But actual paperwork? Not much of that! Then I had a moment on Wednesday...we NEED a space where we can work without too much distraction when there are other people at home. Enter.. the garage! DH & I spent an hour or so (really, it only took a couple of hours tops!) clearing the garage out. We had so much crap in there that needed to go to the tip that it wasn't funny. We have a van that was in there, waiting to be repaired & sold, which is now living on the driveway... I'd rather the neighbors have a slight eyesore (it's not on blocks or anything lol, just doesn't run) sitting out there than have it taking up prime real estate inside! Here is the promised finished product of my 'name' project for our Through the Lens course. I water coloured the background turquoise (my fave colour other than black) and I love to be outdoors, so I put a happy little tree in there (how I miss Bob Ross!) We also journaled a little about our names .. how we got them, were we named after anyone?, the origins & meaning of our names, and what we like about them. It was quite fun, and I think even after the course is done, I'll try to keep doing an activity once or twice a month with Frodo because we both are enjoying it! The 2nd weeks' project is on hands which should be good fun :) We got started on those pics today. 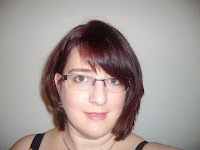 I'm Caz and This is my blog. I've been on somewhat of a hiatus with my children in school, but now Frodo (10) is returning to home education so I'll be back! Frodo has ADHD (although not sure I'm 100% behind that), Sensory Integration Disorder, and so many Asperger's traits that I wonder if he isn't misdiagnosed! We discovered the hard way that he does NOT fit the school mould, needless to say. I hope you'll enjoy this peek at our everyday lives. I don't make any money, get discounts etc based on having this here... just wanted to share a friends small business selling beautiful books!